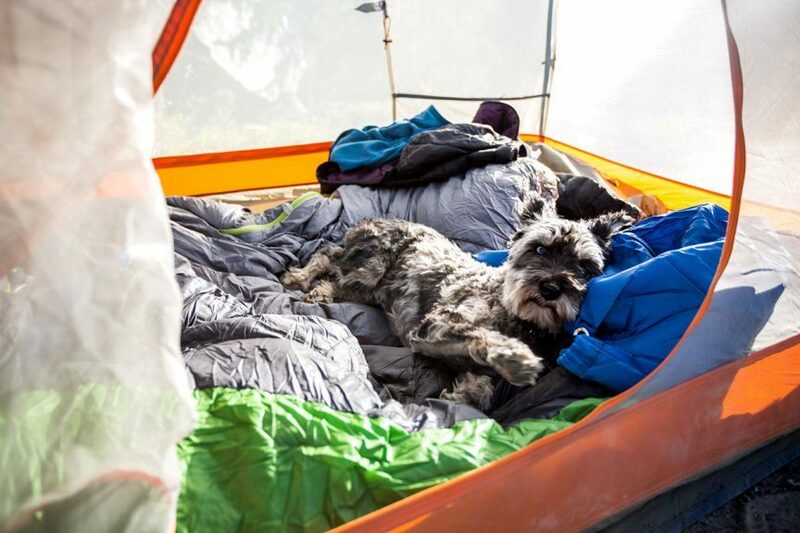 Camping with pups is always a good idea. Photo by Emily Taylor. 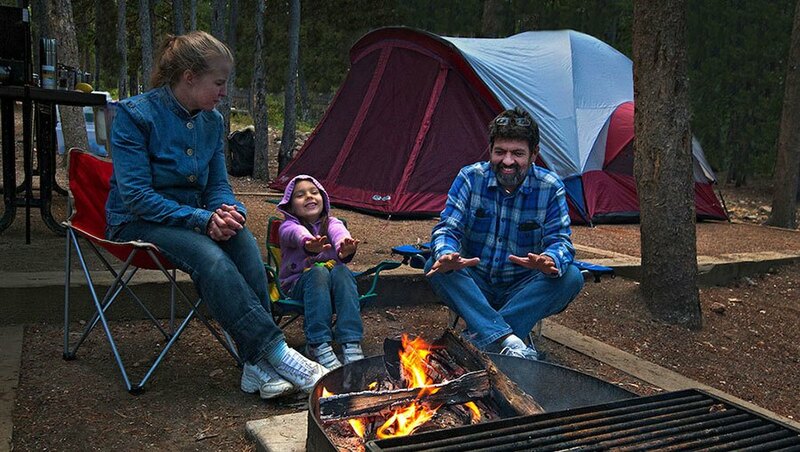 Camping is one of the purest and simplest ways to get in touch with Mother Earth and hit the recharge button. You’re out in nature, roasting marshmallows over a campfire, sleeping under the stars, dirt under your fingernails, hearing only the sounds of running river water and birds chirping. It sounds dreamy. If you enjoy a good camping trip, whether in a luxury cabin or out in the middle of the woods with no cell service, you’re in luck. 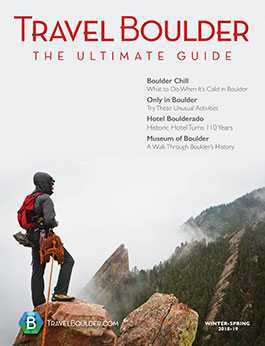 There are plenty of good spots near Boulder to explore and plan a weekend getaway. If you want to go camping directly in Boulder County, your options are limited. There are no actual campgrounds in Boulder city limits, but there are a lot to choose from in a 30-minute to 90-minute drive window. 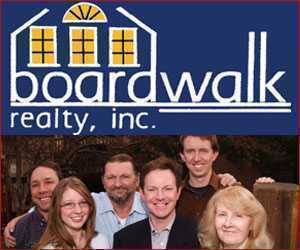 This park, located in Longmont, is only about a 30-minute drive from downtown Boulder. The dog-friendly park is well equipped with 87 campsites, open seven days a week year-round. The campground allows for RVs and tents, with 41 sites equipped with electrical-only hookups and 46 sites that include a full electrical and water hookup. With ponds and trails nearby, campers can fish or kayak, take a hike or bike ride, bird-watch or just enjoy the gorgeous scenery. Campsite costs vary, depending on which hookup you choose and the time of year. A primitive campground through the Colorado Parks and Wildlife is $10, up to $28 per night for a full campground hook-up. 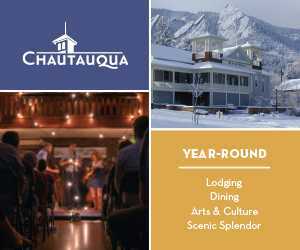 Add $2 a night during peak season from May through September. Reservations are highly encouraged, as this is a popular camping destination in Boulder County. This campground sits in the mountains between historic mining towns Nederland and Rollinsville, less than a 40-minute drive west of Boulder. Open from May to September, the campground offers 46 sites that accommodate tents, trailers and RVs. The grounds provide drinking water, vault toilets, picnic tables, fire grates, and trash services. Plan accordingly, as the grounds do not have electricity, hookups or showers. The Kelly Dahl Campground experiences heavy usage, so reservations are encouraged. However, sites one through 20 are first come, first served. Each site costs $21 a night. If you’re looking to get away, Pawnee Campground is located in the Indian Peaks Wilderness area, just under an hour drive from Boulder. Although a little farther from town, this beautiful location is a great place to spend the weekend. The campground is open from June to September only, due to its higher altitude location and sometimes unpredictable weather. There are 47 campsites that accommodate tents, campers, trailers and RVs. There are no electricity hookups or showers at this location, but it does provide picnic tables, fire grates, water, vault toilets and trash services. The campground sits right next to Brainard Lake. Campers can hike, bike, fish and enjoy nature here. Vehicle fees, cash or check only, are $11 per passenger vehicle and RV, which is good for three days. Nightly rates range from $21-$42, depending on the type of spot you book. A little over a half hour south of Boulder, you can enjoy a glamping experience in Golden Gate Canyon State Park. Glamping, which means camping glamorously, is perfect for the outdoor lover who prefers to sleep and camp in comfort while enjoying some provided amenities. Golden Gate Canyon State Park offers cabins, yurts and a guest house that accommodates larger groups. Activities in the park include hiking, rock climbing, biking, hunting, picnicking, fishing and horseback riding. The cabins and yurts offer similar experiences. The cabins are wooden structures with windows while the yurts are round tents with skylights at the top, giving a more rustic feel. Both accommodate up to six people, with two bunk beds, one twin-size bed and one double-size bed. Bedding is not provided, so come prepared with your sleeping bags and pillows. The cabins also have a natural gas heater, electrical outlets, electric lights, a table and chairs, counter and closet. Make sure to bring your own cooler, as cabins do not have a refrigerator. Outside, fire pits and grills are set up for cooking. Showers and toilets are provided at the nearby Reverend’s Ridge campground. The Harmsen Ranch Guest House accommodates up to eight guests, with four furnished and fully equipped bedrooms and two full bathrooms. This option provides guests with plenty of amenities. including a full kitchen, linen service and gas fireplaces. Golden Gate Canyon Park also offers tent and RV camping in Reverend’s Ridge and Aspen Meadows, as well as in the backcountry for the more adventurous camper willing to hike. 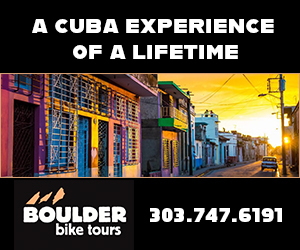 Pricing ranges depending on which site you choose and time of year, which can be found on the Colorado Parks and Wildlife website. Reservations can also be made online or by calling ahead of time. For a much more upscale experience, WeeCasa, located in Lyons, is a tiny-home hotel where guests can see what it’s like to live small. While you’re not necessarily camping out in nature, this experience can provide the same type of feeling that you would expect out of a small cabin or camper. Lyons is located only about a 25-minute drive north of Boulder, still in Boulder County. 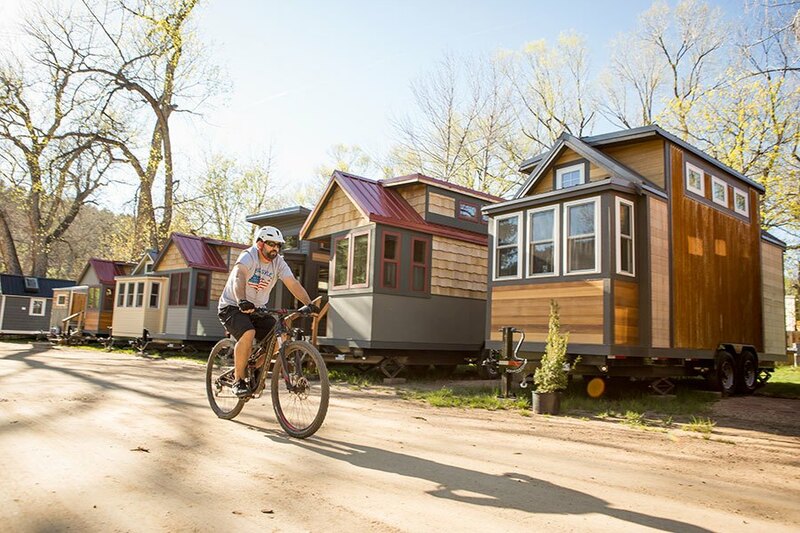 The tiny home hotel offers 23 tiny homes to stay in right along the St. Vrain River, with shops and amenities close by on Main Street. Rates range from $139 to $299. This trail in Ward, about a 45-minute drive from Boulder, is a great place to really rough it out in nature. This is dispersed camping, meaning no hookups or bathrooms, so you have to fend for yourself and pack everything you’ll need. Because you’re not provided with any amenities, camping here is free. The multi-use trail will take you along the river and you can find your perfect campsite anywhere from a quarter mile to three miles in, eventually turning into a 4-by-4 trail. Campsites range in size and accessibility, but there are various options along this trail, whether you’re trekking in with your tent or just plan on hanging up your hammock. Here you can hike, fish, take a dip in the cool stream and enjoy being outdoors. Dream Canyon is a climber’s paradise and a perfect spot to pitch a tent off the beaten path. Campsites sit only a short hike in from the parking lot, and like any other dispersed campsite, you’ll need to bring in all your own gear and amenities. Dream Canyon can be a little tricky to find. From Boulder, head up Boulder Canyon Drive, then get onto Sugarloaf Road. From there, you’ll head about another three miles until you reach Lost Angel Road, which will take you Lost Gulch to find a parking spot. This free camping area is great for tent campers and hammock sleepers alike and provides visitors with amazing views and access to multiple climbing routes. While camping here is great, Dream Canyon is not a great spot for campfires. Starting a fire in this area is illegal and carries up to a $5,000 fine and up to six months in jail. Dry winds in the area can spread flames from coals that have been dormant for up to three days. Don’t risk starting an uncontrollable fire and losing your freedom. If you want a fire, find a different place to camp. If your dream campsite isn’t mentioned above, venture out a little farther to Rocky Mountain National Park, Roosevelt National Forest or Arapaho National Forest for bigger mountains and bigger adventures.